Like when I made these miguelitos with chocolate! 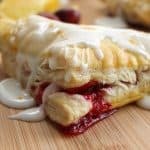 It took only a few ingredients to make them, but the outcome was exactly what I was looking for and so satisfying. I’ve told you before I make homemade pizza every single Saturday. Now this will vary a little when we are traveling, but if something comes up we will push it forward or backwards a day. Anytime I am out of town I make sure I have frozen dough in the freezer so that the family can pull it out and still have pizza, whether I am there or not. 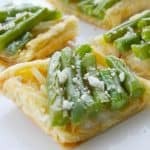 Using puff pastry seems like a fast way to get pizza on the table. I lay it out on the counter and by the time my oven has heated up the pastry is ready to be rolled out. I make it sometimes for myself for lunch. 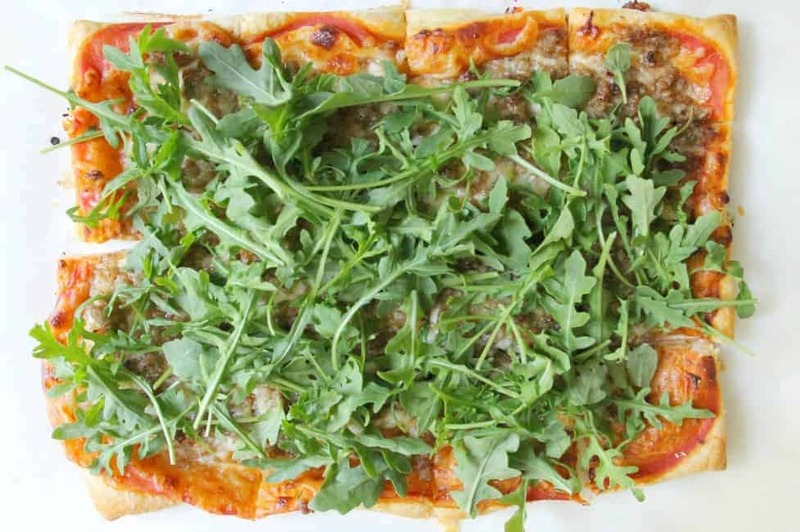 It’s a great way to test out a recipe which is exactly what I did when I made this Puff Pastry Sausage and Arugula Pizza. Now when I am preparing the sausage, I always like to cook it before I add it to the pizza. Two reasons I precook it; one, I can drain the grease off the sausage before I top it on the pizza. Second reason is that I just feel weird about putting raw meat like this on the pizza. It is definitely a personal preference of mine. Though I have read online that because the pizza is cooking for fifteen minutes you could try it without precooking it. I do not recommend this at all. 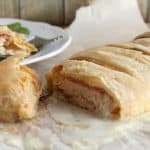 Alternative ingredients you can use to pork sausage is turkey sausage. I’ve used it before on my pizza and it tastes great. If you choose not to use the arugula you could try spinach. 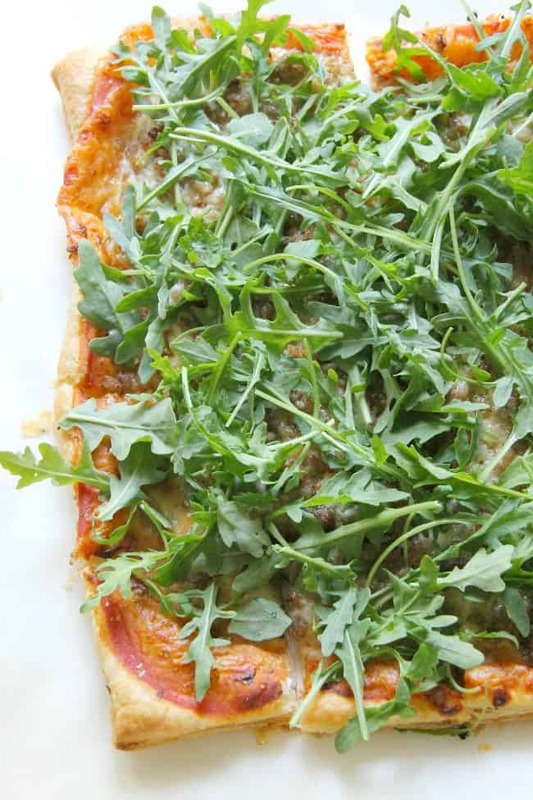 Arugula is an aromatic salad green that has a slightly bitter taste to it. 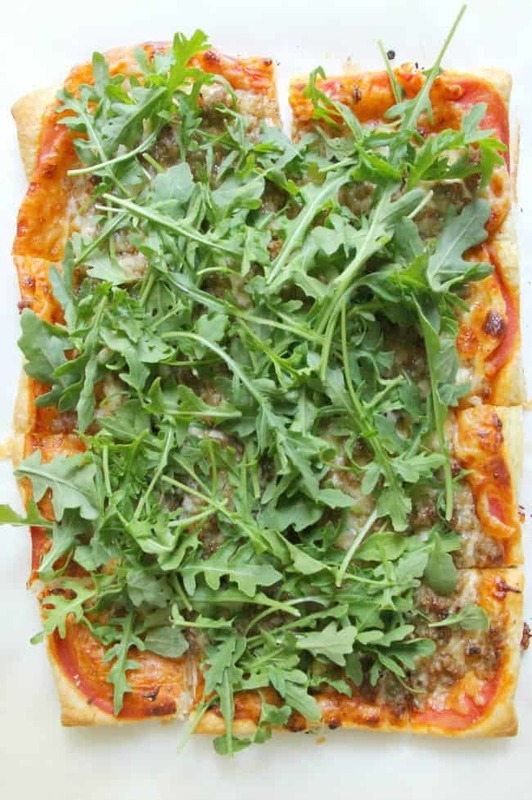 Combining the sausage and arugula is one of my favorite ways to top pizza! 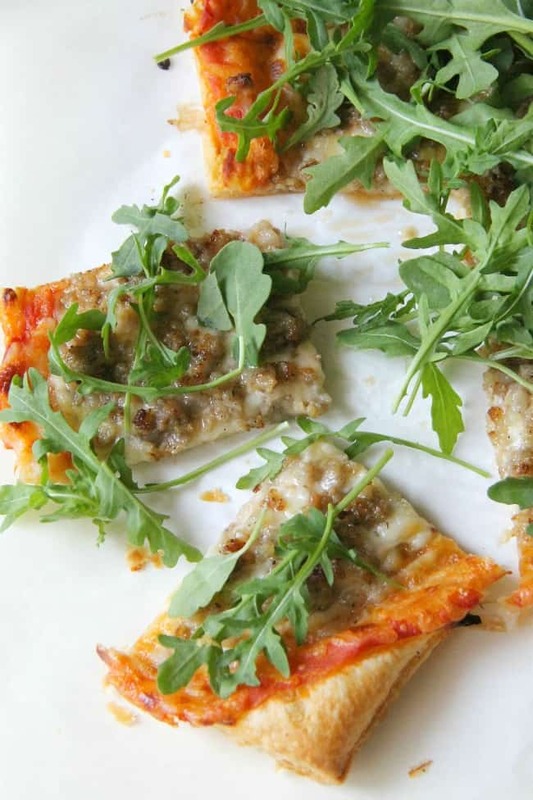 I recommend you definitely try this Puff Pastry Sausage and Arugula Pizza! If you are looking for a puff pastry dessert I’d suggest these Strawberry Shortcake Horns or these Chocolate Amaretti Mousse Cups. This looks amazing and very unique. Definitely a must-try. 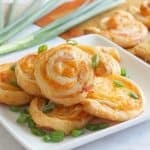 Will ask our cook to try this recipe. Thank you for sharing.